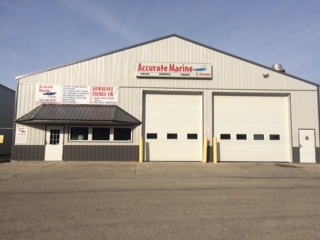 Accurate Marine and Storage was founded in 2005 by the Tom Kleiman Jr family, but it really started in the 80’s. Decades ago, Tom’s Sport Shop was a very busy sportsman’s paradise in the heart of Kewaunee, a Lake Michigan harbor town. Tom’s sons, Tom Jr and Brian, worked in their dad’s shop as kids. Tom Jr started working on small outboards, lawnmowers and snowmobiles. He began attending Mercury and Johnson service schools at 17 while still in High School. The plan was to work and learn and eventually take over the shop. A fire in 1987 changed everyone’s course of direction. Tom Jr took employment at a boat dealer in Green Bay. By age 20 he was one of only 19 master technician for Outboard Marine Corporation in the midwest. He spent the next 17 years working for boat dealers in Green Bay and becoming certified for many other manufacturers like Mercruiser sterndrives, Force outboard, Honda outboards, Johnson/Evinrude outboards, Volvo Penta sterndrives and Kohler generators. Once Tom and his wife Korry started a family they wanted a business for their children to grow up with and have the same kind of head start Tom and his brother did at Tom’s Sport Shop. The Tom Kleiman Jr family bought a boat storage business and started Accurate Marine and Storage in 2005. Today Accurate Marine and Storage is a successful business following in the wake of Tom’s Sport Shop. Tom Kleiman Jr is grateful for every new call and he assures you that he will work hard to earn your business!